It appears that spring has sprung the shopfitters of Worcester Park into a frenzy of activity, with several empty shop units about to be filled, which is great news (sadly not Drury & Cole, though, as that seems destined to remain empty forever). The old 'Choices' video store is being transformed into Papa John's pizza takeaway - although they are only taking half of the unit, so one half of the shop will remain vacant. 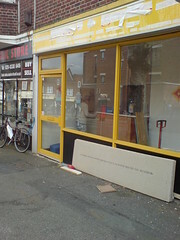 Meanwhile, you may remember the short-lived 'Curry King' takeaway in Windsor Road, next to Mike's Music. I went there, just the once - the kitchen looked less than hygienic, service took forever and they tried and argue their way out of their £10 opening offer. Suffice to say that the rest of Worcester Park seemed to agree that 'Curry King' was 'F*# King' awful and it promptly disappeared. The shopfitters are back, though, and it is being transformed into 'Ginger & Garlic' takeaway (adding flavour to your life, so they promise). 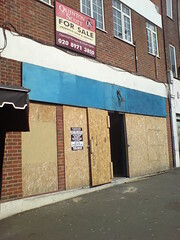 But the award for shortest-lived shop of all was taken by the 'Worcester Park Supermarket' (next to Checkers the sandwich shop) which if I recall was only open a few weeks before unceremoniously being boarded up. 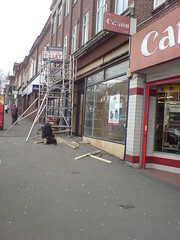 Work has started inside the shop, though, so we will wait with baited breath to see which charity shop opens in its place. Cynical? Moi?